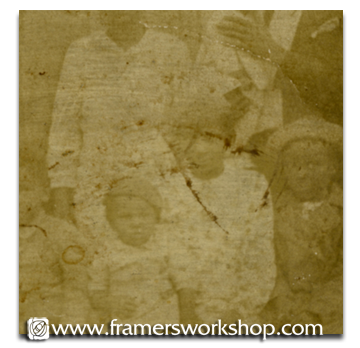 You are here: The Framer's Workshop > Restoration > Can my photograph be restored successfully? 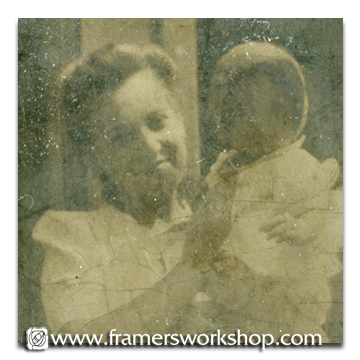 Can my photograph be restored successfully? We are often asked this question. The answer is almost alwaysYES! 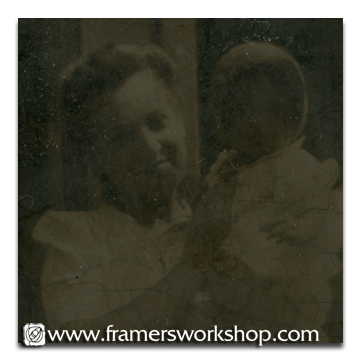 Our main Restoration page shows many examples of badly damaged photgraphs that were digitally restored. However, not all photographs are so fortunate. 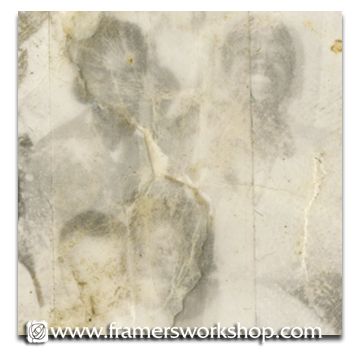 Below are examples of photographs that were so badly damaged it would be impossible to restore them at a reasonable cost. 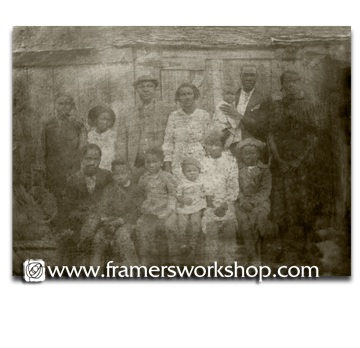 Scroll through them and contrast them with the restored photographes on the main page. The important thing to look for is facial detail. If there is little to no clear contrast and detail of form, chances are the face cannot be restored. 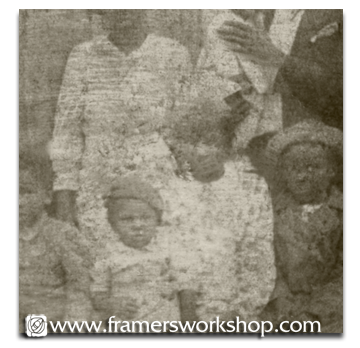 If all the faces in this photograph were as well defined as the four center and left, this photograph could have been restored despite the heavy damage. However, as you can see when zoomed in, there are no defining characteristics in the four faces on the left. They would have to be reconstructed completely from scratch. The photograph above might have been salvagable had it not been shallacked at one time. See details to the right. The shellac texture has muddied the image, reduced the contrast, and eliminated detail. The partially restored detail below shows this more clearly. 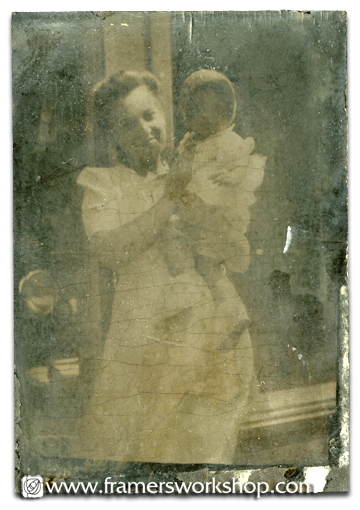 Partial restoration shows that it might have been salvagable had the photograph not been shellacked. See detail, right. 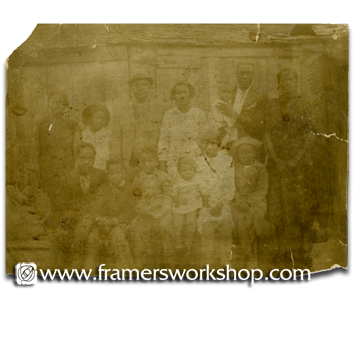 The shellac texture has obscured detail throughout the image, making it imposible to restore. 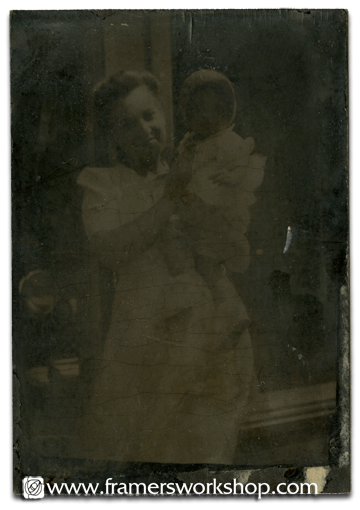 We're not certain why this photograph has darkened so badly but, can it be restored? Adusting contrast in photoshop shows that it is a close call. The mother and her dress could be restored but not the baby's face. See below for detail. Again, the original darkened photograph. The cracks, spots, yellow tone, and so on, could be removed. But because the child's face is in shadow, there is no detail to work from or enhance. If after looking at these examples, you're not sure if your photograph is restorable, pelase bring it in to us for appraisal. In most cases it can be done to your satisfaction. 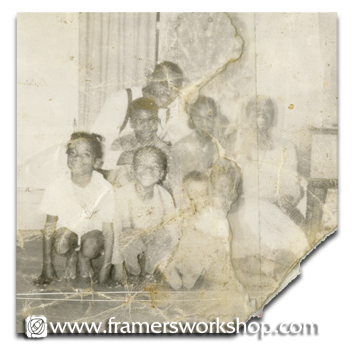 The examples shown above are three instances of unrestorable photographs out of hundreds we have restored successfully.